In today’s world, the work environment in clinical laboratories has become complex and challenging. The key reasons are that the workload in labs has increased multiple times, in addition to increased cost, less staff and high expectations on TAT. Relying on solely the capabilities of LIS or HIS will not bring productivity, especially when you have various disparate systems. One of the solutions to overcome the challenges is in implementing specialized software programs that link LIS/HIS/EMR systems with the machines and instruments that run in labs. These programs provide automatic review and release test results, providing the technologists additional time to attend to true exceptions and focus on quality. These programs not only connect within a center but also aid in reviewing multiple instruments located at different locations. 21CI's sLink is such an interface software link that helps to interface automation, instrumentation, and information systems at multiple locations. Through the years we have worked with virtually every leading LIS/HIS, diagnostic equipment manufactures and a growing number of anatomical pathology systems. Our focus is to provide superior value to our customers in the field of equipment interfacing services. Our interfaces will establish workflow routes, reduces delivery time and aids operational growth without loss of performance. Through real-time interfacing with laboratory equipments, we develop criteria or rules that act on every data element in the system to automate, streamline, and enhance the lab workflow. 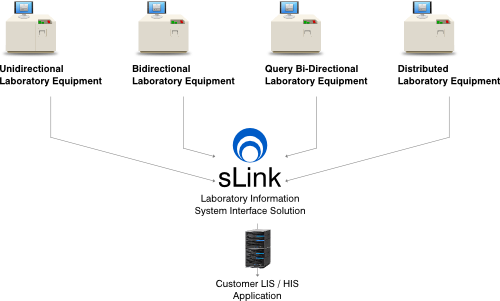 When a test order is placed in the EMR/HIS/LIS, the sLink Lab Interface allows you to receive your lab results electronically and to upload them directly to the system seamlessly, with just a single click. With sLink, you no longer have to file the lab results in the paper chart (nor scan/attach to EMR/HIS) and you don't have to worry about managing all the paper labs that you've signed. sLink routes the results to the order provider as well as patient's chart. We provide sophisticated electronic handling of patient lab orders and test results via standard ( HL7 based ) or non standard interfaces. With sLink the order is created in the EMR and automatically sent to the lab. This is an incredible time saver and the accuracy level is high. The largest benefit to the lab interface that the results are obtained electronically, which saves much more time when compared to receiving a paper copy of the lab results. With sLink interface all the lab results are stored as unique values. The results are stored in this format for future use such that the lab results can be mapped graphically over time; this facilitates studies on lab results across patient population and also possibly satisfy government and insurance reporting requirements. Labs can also further enhance productivity through sLink, which empowers them to connect with multimodal devices seamlessly. Our Interface solution comes with readymade plug-and-play features that allow considerable amount of time saving. The application has features that allow labs to customize it or rather use it in a "do-it-yourself" fashion.